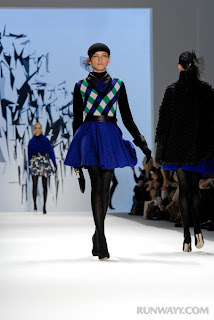 Milly Fall 2012 is inspired from high-tech materials and innovative fabric manipulation. Hues of heliotrope, clover, shocking pink, and chartreuse create a bold, colorful contrast to white, charcoal and black neutrals. 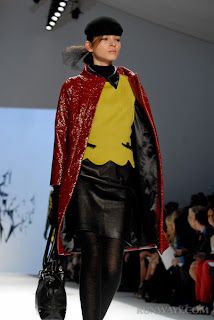 Fabrics and textures include leather, laminated tweeds, brushed wool crepe, structured jacquards, leather and silk. The charcoal brushed wool crepe Infant cocktail dress, heliotrope laminated check tweed funnel-neck coat, black leather circle skirt, red crinkle patent leather funnel-neck coat and lurex cloque dot cocktail dress are my favorites, adding a modern edge to Milly's youthful and feminine luxurious style.